Justice Ginsburg Appears Strong In First Appearance At Supreme Court This Year The justice has been recovering at home since late December. She missed January's oral argument days but participated in those 11 cases based on written briefs and transcripts of the arguments. Supreme Court Justice Ruth Bader Ginsburg, after speaking to law students last September. She is back in the courtroom for oral arguments on Tuesday for the first time since lung cancer surgery in December. The 85-year-old liberal feminist icon underwent surgery for lung cancer in late December and since then has been recovering at home. In January, for the first time in her 25-year tenure, she missed being in court for oral arguments, but she participated in the decision of those 11 cases based on the written briefs and transcripts of the arguments. At her return for Tuesday's arguments, Ginsburg was the first to ask a question in a patent case that normally would have drawn no press attention. Instead, the press rows were nearly full. At the end of the argument, Ginsburg got up carefully. As she descended the steps behind the bench, Chief Justice John Roberts walked next to her, ready to help. But Ginsburg walked on her own. As luck would have it, after the January arguments, the court had scheduled a monthlong "writing break," allowing Ginsburg extra time to recuperate and work from home. Last Friday, Ginsburg returned to the Supreme Court building for the first time to participate in the justices' private conference, the first such conference scheduled since mid-January. Ginsburg has been working hard to regain her strength. Friends say she is walking more than a mile a day and is once again working out with her trainer twice a week. On Tuesday, all eyes were on her in an otherwise dull session. The diminutive justice can be hard to see behind the tall structure that towers above those mere mortals in the courtroom who are not up there on "the bench." Indeed, she is so tiny that spectators often can hear her voice but can only just see the top of "The Notorious RBG's" head. 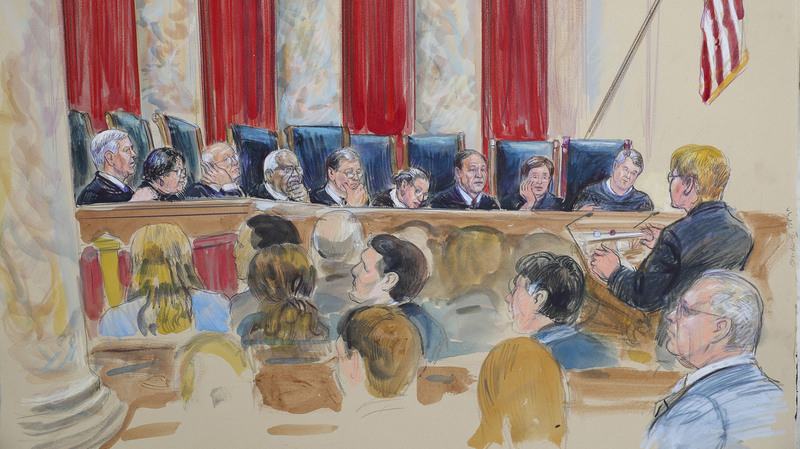 Ginsburg, sketched here with the rest of the Supreme Court last year, worked from home on the cases the court heard in January. On Tuesday, she returned to the bench. Ginsburg is not attending the Academy Awards ceremony on Sunday, where the documentary RBG, about her life and her work as the architect of the fight for women's rights in the 1970s and '80s, has been nominated for an Oscar. Doctors at Memorial Sloan Kettering Cancer Center operated on Ginsburg Dec. 21, removing one of the five lobes of her lungs. Days later she returned to Washington to recuperate. Doctors said that the pathology report on her lungs found no further evidence of disease and that no further treatment is planned. While this is Ginsburg's third bout with cancer in 20 years, statistics indicate that patients with a lung cancer found early, as this one was, have a recovery rate of 70 to 80 percent. Ginsburg's cancer was found incidentally, when doctors noticed an abnormality in CT scans taken after she fell and fractured her ribs last November. Ginsburg has made no secret of her desire to serve on the nation's highest court until someone more to her liking, not President Trump, is in the White House. 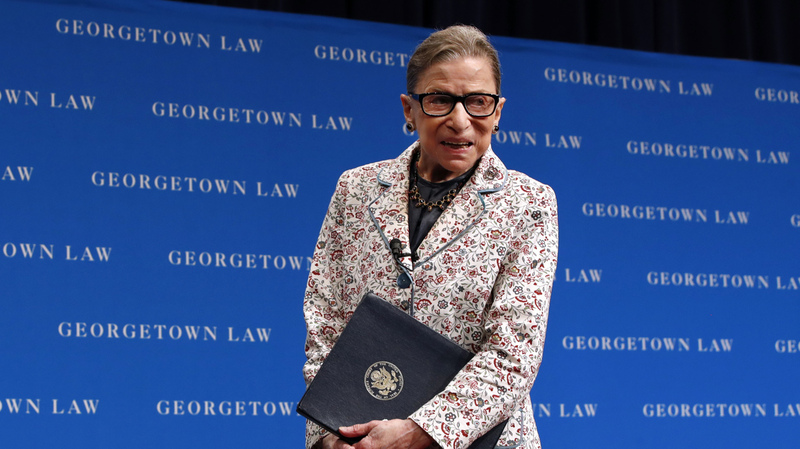 She has no plans to retire anytime soon — though she is 85 years old, she can see the current Supreme Court moving decidedly to the right. The hard-right ideological turn is taking place following Justice Anthony Kennedy's retirement last summer. Kennedy, a centrist conservative, often cast the deciding vote in closely divided cases. He was replaced by Brett Kavanaugh, a far more conservative judge and the second Trump appointee to the court. That single appointment means that conservatives now occupy five of the nine seats on the Supreme Court; any further vacancy among the court's four liberals would mean not a 5-to-4 conservative majority but a 6-to-3 majority. In other words, room to lose one vote and still prevail in any given case. Washington legal circles are rife with rumors that Justice Clarence Thomas, the court's most conservative member, might retire this summer. The theory is that were he to retire, Trump could nominate someone in his or her 40s to replace the 70-year-old Thomas, thus guaranteeing a longer-term grip on the Supreme Court seat Thomas now occupies. Trump has hosted Thomas and his wife for dinner at the White House and met with Ginni Thomas and some of her conservative activist friends. Press reports of that meeting indicate that the president seemed surprised by some of the ideas espoused by some in Ginni Thomas' group, including, according to the New York Times, the notion that women do not have the musculature or lung capacity to serve in the military. Trump may hold some unorthodox political views, but he clearly understands that the people he places on the nation's federal courts, not just the Supreme Court, will have an impact that lasts far longer than his presidency. He has achieved a record-high number of appointments to the federal appeals courts, the courts that rank just below the Supreme Court. He has appointed 30 of those judges, more than any other president at this point in his first term.